Democrat Gretchen Whitmer stands with United Auto Workers president Dennis Williams in Detroit for an event announcing the 385,000-member union’s endorsement for Michigan governor. Democratic power brokers are falling in line behind Gretchen Whitmer’s bid for governor after a winter of discontent. Two months after union leaders and Detroit Mayor Mike Duggan engaged in a closed-door campaign to recruit another Democrat into the race, endorsements are coming fast for Whitmer, the former Senate minority leader from East Lansing. On Monday, the United Auto Workers followed Duggan and the Teamsters in endorsing Whitmer. Leaders of both unions, UAW President Dennis Williams and Teamsters President James Hoffa, had met with Duggan in January to try to recruit U.S. Sen. Gary Peters into the race, as Bridge Magazine first reported. 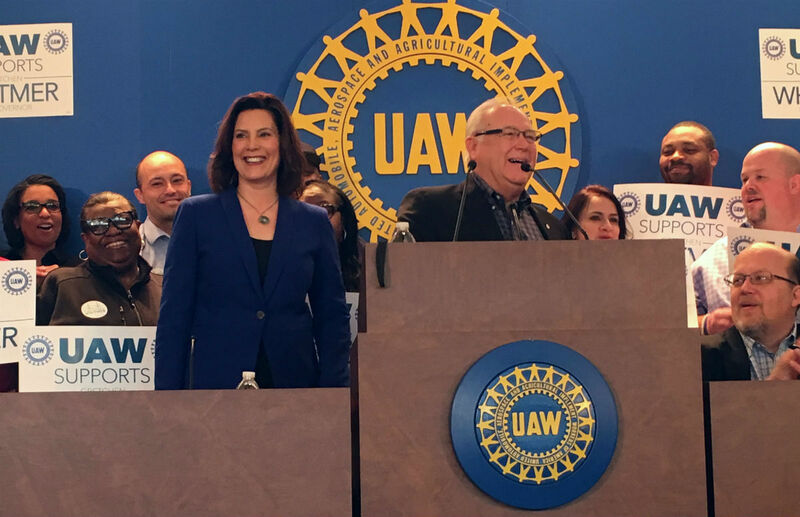 "Many people came to us early on, asking for our endorsement and we decided, 'lets watch the candidates, how they perform, what they say and look and what they have done,'" Williams said Monday during an event at UAW headquarters in Detroit. "We came to one conclusion: There is no better candidate for governor of state of Michigan than Gretchen Whitmer. Gretchen has been someone who stood with working men and women for a long time." The union represents 385,000 workers and is Whitmer’s highest-profile endorsement yet. Detroit-area Democrats had fretted that Whitmer wasn’t well known enough in southeast Michigan to win in a race party loyalists hoped would be easier because of the low job approval ratings of Republican President Trump and term-limited Republican Gov. Rick Snyder. “A few months back, there was a lot of concern in the Democratic Party about whether Whitmer would gain traction,” said Jonathan Kinloch, chairman of the 13th Congressional District Democratic Party, which is not making an endorsement before the primary. After the endorsement, Williams told reporters that he doesn't remember who initiated the meeting to try to recruit Peters into the race, but added the UAW "didn't want to make a decision until the full (candidate) field was in place." Polls have shown Whitmer is the clear frontrunner, but Kinloch and others said much could change before the Aug. 7 primary. Newcomer and challenger Shri Thanedar’s heavy spending – including a Super Bowl ad – may have given him a bounce: A March poll found he has more name recognition and higher favorability ratings than Whitmer. “Endorsements from organizations like the UAW do make a big difference in the Democratic primary, but Democrats have their own sort of civil war between the establishment and new wave progressives,” said Richard Czuba, a pollster with the Lansing-based Glengariff Group. Whitmer’s three primary opponents – Thanedar, former Detroit Health Director Dr. Abdul El-Sayed, and Oakland County business executive Bill Cobbs – are campaigning as progressive outsiders bucking the Democratic establishment. “We have many endorsements from people, but are not focused on endorsements from establishment,” Thanedar, an Ann Arbor entrepreneur, wrote in an email to Bridge. El-Sayed’s campaign provided Bridge a list of about 20 endorsements from progressive groups such as Justice Democrats, the Michigan Democratic Party Young Democrats Caucus, the People for Bernie Sanders, the American Muslim Caucus and Black Lives Matter activist Shaun King. Cobbs didn’t respond to requests seeking comment on his endorsements. Czuba said he doubts the other Democrats are strong enough to “galvanize the left” and seriously challenge Whitmer. Czuba said her early entry into the campaign deterred a litany of potential challengers. Besides Peters, Democratic power brokers had sought to recruit U.S. Rep. Dan Kildee of Flint, University of Michigan Regent Mark Bernstein and even former U.S. Rep. Bart Stupak of Menominee into the race, sources have told Bridge Magazine. “Maybe it’s time to step back and recognize that Gretchen Whitmer deserves some credit for running a savvy race because she’s driven all big names out of the race,” Czuba said. After the endorsement event, Whitmer told Bridge that she has "built a coalition unlike anyone has ever done (this early) in the election cycle." "That's something to celebrate, and I'm excited," she said. Like all typical political creatures, the UAW bravely waited to see who would be the most likely nominee and then courageously bestowed it's endorsement on them! Oh the suspense! Another profile in courage! Why is this a story? It was a story because of the union's reversal from just two months earlier when it was quietly seeking someone to challenge Whitmer. Didn’t the UAW also endorse Clinton? How did that work out for you.